Winner. A River Running West: The Life of John Wesley Powell. By Donald Worster. Published by Oxford University Press, New York. For years, people have been waiting for this book: an authoritative study of Powell—the whitewater world's first river runner as well as the West's great voice of reason. Thanks to Donald Worster, we now have one. A superbly written book supported by exhaustive research, this 673-page book is an expansive view of Powell's life and times—as expansive as the view across the Colorado Plateau. A River Running West is a memorable portrait of one of the greats of river history. Winner. Sunk Without a Sound: The Tragic Colorado Honeymoon of Glen and Bessie Hyde. By Brad Dimock. Published by Fretwater Press, Flagstaff, Arizona. The 1920s was the decade of mysteries for the outdoor world. The mountaineering world had Mallory dissolving into the mists of Everest, while the whitewater world had Bessie and Glen Hyde disappearing in the depths of the Grand Canyon. This fascinating exploration into what happened to the Hydes is an important contribution to the whitewater genre, and seasoned Colorado River boater, Brad Dimock, was the perfect person to write it. Few others would have been able to put the right amount of heart and soul into an investigation of the mystery; indeed, Dimock and his wife, Jeri, actually built a replica of the Hydes' wooden scow and ran the river in much the same manner as the young couple would have done in the 1920s. Enthralling and compelling, this is a book that refuses to be put down. Winner. Where the Pavement Ends: One Woman's Bicycle Trip Through Mongolia, China and Vietnam. By Erika Warmbrunn. Winner. Wilderness and the American Mind. By Roderick Nash. This groundbreaking book, first published in 1967, is Roderick Nash's classic study of American attitudes toward wilderness. Beginning with the Old World's roots of opinion and reaching through the early twenty-first century, it ties together disparate elements of philosophy, history, politics, and popular attitudes into a concurrent and understandable whole. Scholarly and perceptive, Wilderness and the American Mind numbers among the great works on the outdoors. Winner. The Living Wild. Photography by Art Wolfe. Published by Wildlands Press, Seattle. This is a book that will take your breath away. The Living Wild is a technical and intellectual marvel, providing a photographic celebration of the diversity of life inhabiting our planet. Celebrated nature photographer Art Wolfe took three years to produce the color photographs of 140 different species from 40 different countries that grace the pages of this large format book. 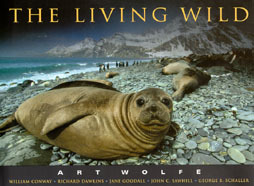 Wolfe is clearly at the top of his game in The Living Wild, and this book should reinforce his position among the best nature photographers in the field. Using a highly effective combination of lens size and perspective, he almost brings the viewer into the photograph, blurring the boundaries of real and artificial. It's a sight to behold. In What Does the Sky Say?, a child watches the sky through the changing of the seasons and in all kinds of weather, all the while learning to listen to the voice of the sky. The message of Nancy White Carlstrom's imaginative and poetic text is calming and inspiring, and Tim Ladwig's colorful illustrations capture the magic of childhood and our deep connection to all creation. For all ages. Winner. Coyote and Badger: Desert Hunters of the Southwest. Written and illustrated by Bruce Hiscock. Published by Boyds Mills Press, Honesdale, Pennsylvania. This book, for children from 7 to 10 years old, is a natural history story about predators and their struggle to survive. The tale unfolds when a coyote and badger meet and a mysterious bond forms between the two as they begin hunting together. Set in New Mexico among Anasazi ruins, the story is perfectly complemented with Bruce Hiscock's warm and luminous watercolors of a spacious desert. Winner. Wild Solutions: How Biodiversity is Money in the Bank by Andrew Beattie and Paul Ehrlich. Illustrated by Christine Turnbull. Published by Yale University Press, New Haven. Eminent ecologists Beattie and Ehrlich team up in this text for a careful examination of the earth's biological diversity. Wild Solutions shows how the natural systems that surround us play an important role in protecting our basic life-support systems. Based on a solid and well-developed premise, it's a convincing book conveying a powerful and urgent message. Winner. For Love of Wildness: The Journal of a U.S. Game Management Agent. By Terry Grosz. Published by Johnson Books, Boulder. For Love of Wildness is the eagerly awaited sequel to Terry Grosz's first book on his life as a wildlife officer--and he certainly doesn't disappoint. An absorbing book, written in an honest and down-home style, Terry Grosz takes the reader along on a wild ride of chases, stakeouts, and shoot-outs in his efforts to protect America's wildlife. Winner. Pacific Light: Images of the Monterey Peninsula. By Douglas Steakley. Poetry by Ric Masten. Published by Carmel Publishing Company, Carmel, California. This is a book of geography and of passion, communicating its story through the interplay of images and poetry. From Douglas Steakley's breathtaking photography emerges the face of the Monterey landscape while Ric Masten's words provide its voice. Winner. Butterflies Through Binoculars: A Field Guide to the Butterflies of Western North America. By Jeffrey Glassberg. Published by Oxford University Press, New York. This magnificently crafted guidebook is illustrated with vivid color photographs that set a new standard in butterfly identification. It's a guide that can quickly grow on you. In no time, you may find yourself hopelessly hooked--and haunting the fields and forests searching for those delicate insects that add so much color to summer afternoons. Honorable Mention. The Raptor Almanac: A Comprehensive Guide to Eagles, Hawks, Falcons and Vultures. By Scott Weidensaul. Published by The Lyons Press, New York. A far-reaching reference and guide to raptors, this book is for those bird-watching enthusiasts who want to go beyond the fundamentals. Its contents include raptor evolution, behavior, courtship, nesting, migration, and more. Winner. The Orvis Fly-Tying Guide. By Tom Rosenbauer. Illustrations by Rod Walinchus. Fly Pattern Photographs by Henry Ambrose. Published by The Lyons Press, New York. Never tied a fly before? This is the book to get. With its clear, step-by-step instructions, great color photographs, and uncluttered and thoughtful design, you'll find yourself tying up streamers, nymphs, as well as dry and saltwater flies in no time. Winner. Fifty Favorite Climbs: The Ultimate North American Tick List. By Mark Kroese. Published by The Mountaineers Books, Seattle. This splendidly done, full-color treat-for-the-eyes blends personality and place, showcasing fifty accomplished climbers and their favorite climbs. Each section includes a biographic sketch of the climber, a story about his or her chosen climb, and a route description clearly illustrated by a photograph and accompanying schematics. Honorable Mention. Hike America Virginia: An Atlas of Virginia's Greatest Hiking Adventures. By Bill & Mary Burnham. Published by The Globe Pequot Press, Guilford, Connecticut. Strike out and explore the trails and history of Virginia's backcountry in this handsomely designed and well-written guide. Honorable Mention. 101 Hikes in Northern California: Exploring Mountains, Valleys, and Seashore. By Matt Heid. Published by Wilderness Press, Berkeley. Idaho Outdoors columnist for the Idaho Statesman, adjunct faculty at Boise State University, licensed Idaho guide and active member of the Outdoor Writers Association of America. Doctorate in Recreation and Leisure Services. Program Director of Teambuilding and "ORION," a freshman wilderness orientation program in conjunction with Shaver's Creek Environmental Center at Penn State University. Teaches adventure leadership and adventure programming. Past Program Director, Clemson Expeditions, South Carolina. Program Director and Senior Trip Leader, America's Adventure, Colorado. Masters in Outdoor Education. Ornithologist (600 birds on her life list), contributing writer for Minneapolis Star-Tribune and Northlife Magazine. Winner of the 1997 National Outdoor Book Award for her work Sharing the Wonder of Birds with Kids--and Dave Barry's bird and tapeworm advisor. Teaches adventure literature at Indiana University. Currently working on a Ph.D. dissertation analyzing the evolution of mountain symbology in 19th century British literature. Instructor for Voyageur Outward Bound School. Outdoor Recreation Dept., Unity College, Unity ME 04988. Phone: 207-948-3131 (x213). Associate Professor in Outdoor Recreation at Unity College. Board member of the Association of Outdoor Recreation and Education. Editor-in-chief of Sierra magazine; former managing editor of Climbing magazine and chief editor of High Country News. Joan's freelance work has appeared in Audubon, Defenders, and National Wildlife. Contributing Editor for Backpacker Magazine. Former outdoor columnist for Seattle Post-Intelligencer, and an outdoor mom. Coordinator of the Outdoor Adventure Program at Colorado State University. Has also worked in outdoor retail (10 years) and is the former owner of a backcountry yurt system. Longtime journalist who has worked at seven newspapers, two trade papers, two Web sites, one news service and one magazine. Los Angeles-based free-lance writer reviewed outdoor books for his own column and was co-editor of an outdoor-oriented Web site. Winner of several Associated Press honors among other awards. Director of the Center for Geography and Environmental Social Sciences, Huxley College, Western Washington State. Executive Editor of the Journal of Environmental Education. Author/Editor (North Cascades, Guardians of the Parks and Adventure Education, etc.). Outdoor Industry Attorney, author (Lawyer's Adviser), organizes outdoor liability workshops for such groups as the Western River Guides, Professional Paddlesports Association, Boy Scouts of America, Wilderness Education Association and federal land agencies. Interpretive Naturalist Consultant for a series of twenty Time-Life Books. Vice President, National Association for Interpretation. Assistant Professor of Park Management, Unity College. Thru-hiker of the 2,100-mile Appalachian Trail. Professor of Biology at Feather River College, California. Doctoral work on the Common Loon. Author of Sierra Nevada: Tree Identifier. Currently working on a collection of nature writings. Poet and a naturalist guide on the Colorado Plateau. Leads backcountry trips for the Museum of Northern Arizona and teaches art and writing workshops for the Museum, Northern Arizona University and outdoor education centers. Author of Waterlines: Journeys on a Desert River. Full-time mom. Former director of the Outdoor Program at Texas Tech University in Lubbock (5 years). Presently working in outdoor retail at REI--Oakbrook. Masters in Outdoor Education (Northern Illinois University).